Based on reviews from 29,764 users. 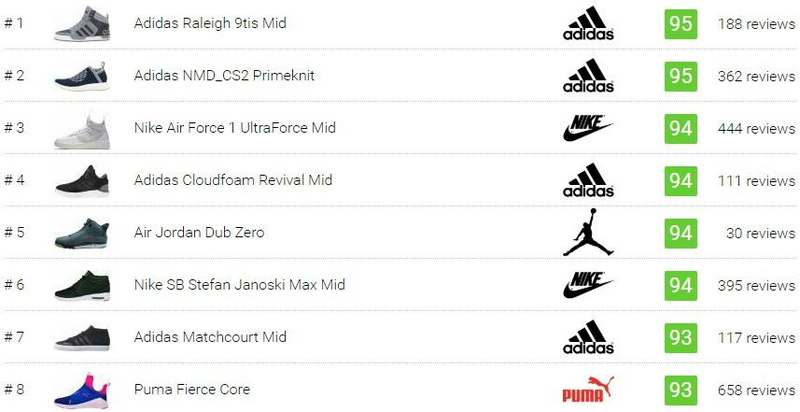 Learn how our rankings work or see our guide to mid top sneakers. Updated Apr 2019. Sneakers have always been the go-to footwear of choice for many people because they are comfortable, durable, lightweight, and versatile. 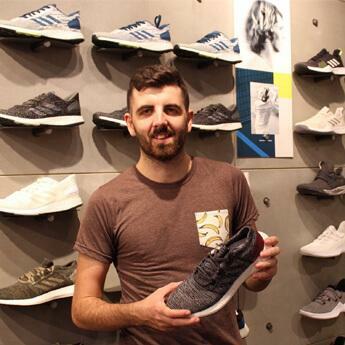 Sneakers are often preferred for its practicality and functional uses, but they have also become a fashion staple and even as collector’s items for some shoe enthusiasts. Sneakers can be classified based on categories. There are separate types of sneakers for men and women, while some are designed as unisex models. Sneakers can also be categorized based on their design origin as most are inspired by athletic activities such as basketball, tennis, football, running, skate, training, or hiking. Lastly, sneakers can further be categorized based on cut or structure. There are three types of sneakers in this category – the low top sneakers or the lows, the mid top sneakers or the mids, and the high top sneakers or high tops. Dominant in the market of the three types are low top sneakers. Sneakers under this category do not cover the ankle and are usually lightweight and minimal in design. They have a myriad of styles and variations that cater to sneaker aficionados and ordinary consumers from one generation to the next. High top sneakers are the opposite of the low tops. The collars of these sneakers cover the ankle for added comfort and ankle support. Most common in basketball-inspired sneakers, they are secondary to the low tops regarding popularity. Mid top sneakers fall between the other two sneaker categories. They are the kind of sneakers that are not too low nor too high as their collars are typically just up to the ankle level. Because of this, they are often confused with the high tops, especially when brands do not state upfront that they have a mid-cut construction and not a high-cut. Among the three types, mid top sneakers take the smallest portion of the market share of sneakers. Mid top sneakers aren’t as ubiquitous and as popular as the other two types, but consumers still take notice of its presence. It is also common for some low top and high top shoe models to have mid top variations. What are the advantages and disadvantages of the mids over the lows and highs? Mid top sneakers provide ample ankle support and cushioning, which are lacking in low top sneakers, but not as restricted as that of what high top sneakers deliver. Mid top shoes offer more foot cushioning, stability, and support than the low tops because of the padded collar that surrounds the ankle. Most mid top sneakers also feature a lateral ankle strap for added support. The added foot coverage of mid top sneakers gives added protection for the feet on outdoor settings or for muddy and wet surfaces. This is an advantage over low tops with open collars that only makes it easier for water and dirt to get into the shoe. The added eyelets at the ankle of mid top sneakers enable the laces to be tightened even further for a more locked-in and secure fit. The mid-cut construction of mid top sneakers is also more suitable in colder weather conditions since it gives added warmth to the feet. The added ankle coverage somehow confines movements of the ankle, but not as much restriction from the high tops. Different from low top sneakers, most mid top sneakers are trickier to style with the right outfit. Wearing this kind of sneakers is more challenging for their profile are not as versatile as the low tops. Mid top sneakers do not have that much variety design-wise compared to the low-tops. Their overall style is limited. Mid top sneakers may have their advantages and disadvantages over low tops and high tops, but it is important to note that some advantages may be a disadvantage for some and vice-versa. In the end, it all boils down to the buyer’s personal preference and intended use of mid top sneakers. You may think that a specific mid top sneaker model is not as stylish as its low top counterpart, but there surely is someone somewhere that thinks otherwise. What are the types of closure used in mid top sneakers? As with typical sneakers, mid top sneakers often have a lace-up closure which can be adjusted or customized depending on the wearer's preference. There are extra eyelets at the ankle, usually two pairs, that enable a much tighter fit. Some mid top sneakers also feature extra eyelet on the tongue. Not solely for the aesthetic purpose, it also functions to keep the tongue in place and avoid having it slide to one side which can be uncomfortable for some wearers. Velcro straps are highly common for low tops and high tops, but mid top sneakers are also taking part in this craze. Both aesthetically pleasing and functional, Velcro straps are sometimes referred to as the cross-straps. Aside from the traditional lace closure, there are mid top sneakers that feature Velcro straps at the ankle for additional ankle support. Nike has a great share of mid top sneakers in this style department. Some models, however, feature Velcro straps at the midfoot for optimum support. There are also a few mid top sneakers with double cross-straps, which functions just the same. Mid top sneakers with sock-like upper and boot-type structure often feature a zipper type of closure along the medial and lateral sides. This kind of closure also goes hand in hand with lace-up closure and Velcro straps. It adds a plus point in styling aspect while being functional. Least common for mid top sneakers, the slip-on type of closure can be found in mid tops with a one-piece, sock-like upper material or boot-like construction that conforms to the feet. The Adidas NMD_CS1, Adidas NMD_CS2 Primeknit, and Puma Fierce Core are some of the mid top sneakers bearing this type of closure. Often, mid top sneakers are designed with a combination of closure types as the overall profile of these shoes allow such option for added aesthetics and function. Numerous mid-tops in the market feature a combination of lace up and Velcro, Velcro and zipper, or even a combination of the three types. One example is the Adidas Yeezy 750 Boost, which features a lace-up closure, a midfoot Velcro strap, and a full-length zipper on the side. Are mid top lifestyle sneakers different from the low top and high top sneakers concerning fit and sizing? Mid tops are no different to low tops and high tops when it comes to fit and sizing. It varies per shoe model across and within brands. Some mid top sneakers are limited only to men’s sizing, while some fits narrow, small, or true to size. Here at RunRepeat, each sneaker model review includes Fit & Sizing information to guide you on how it fits and what sizes are available for that particular sneaker. The best way to find your correct size and fit when purchasing mid top sneakers online is to base your judgment on reliable user reviews and retail shops' or official brand sites' fit and sizing guide. As for RunRepeat, the “Good/Bad/Bottom Line (GBBL)” section for sneaker reviews often indicates how reviewers remark a particular sneaker’s sizing and fit. This is useful information that you can rely on when buying a pair of mid top sneakers online. The construction of mid top sneakers allows a supportive fit and feel to the feet. There is an adequate cushioning from the ankle down to the toes. How popular are mid top casual shoes? Of the three sneaker types, the mid tops are the least popular. Low tops have always been prevalent and sought-after across generations because they are typically more affordable and versatile for casual use. Regarding fashion trends, mid top sneakers are not as dominant as the two other sneaker types as well. But this does not mean that mid top sneakers do not have a fair share of stylish models for casual use. Mid top sneakers have also been a subject of sneakers brands' collaborations with professional athletes, sneaker boutiques, and notable persons in the sneaker industry such as Stefan Janoski, ACRONYM's Errolson Hugh, Stone Island, and much more. Mid tops are more popular in men's sneakers than in their female counterparts. Although there are mid top models on the market that are women-exclusive like the Puma Fierce Core. What are the origins and constructions of mid top kicks? Sneaker brands have different takes on classifying their sneakers based on cut or construction. There is no standard when it comes to classification based on a sneaker's cut. The collar height of mid top sneakers varies per brand and even mid tops within the same brand. Often, footwear brands like Nike, Adidas, Reebok, Puma, New Balance, Asics, and Under Armour specify the cut of specific sneaker models by incorporating the word "mid" or the acronym “MT” (which stands for Mid Top) in the shoe's official name. Same with high top sneakers, most mid top sneakers are inspired by basketball shoes. It is common for these sneakers to utilize leather and mesh on their upper for durability, support, and breathability. These mid top sneakers also exhibit sufficient reinforcements on the lateral sides and around the ankle for added support and stability. Typically, those based on skateboarding have upper materials composed of leather, suede, or a combination of the two to withstand wear and tear. They also have sufficient reinforcements throughout the upper, especially in the toe box, for ample hold and support to the feet. Mid top sneakers based on running shoes are typically made up of lightweight materials and a breathable upper to allow ventilation and flexible foot movement despite the mid cut construction. Hiking-inspired mid top sneakers, on the other hand, are usually heavy-duty, waterproof, or water-resistant. They also often exhibit rugged outsole with deep grooves for optimum grip and traction. Leather and suede are the most common upper materials of this type. Training-inspired mid top sneakers are typically lightweight, well-cushioned, and constructed to keep the feet dry and well-ventilated. Sneakers of this kind also have lateral reinforcements for improved stability and support. What should I consider when choosing a pair of mid top sneakers? The mid-cut construction of these shoes makes them suitable for cold weather condition as it keeps the feet warm and dry. Some mid tops even incorporate shoe technologies that make them water-resistant or waterproof. Mid top sneakers that utilize sock-like materials on the upper, on the other hand, are best suited during the warm weather as they are breathable. Mid top sneakers are relatively costly than the usual low tops mainly because their construction requires more use of raw materials. Their production cost is also higher. The price of mid top sneakers also varies across footwear brands, release type, materials used, and the inclusion of top-tier shoe technologies. Higher prices expectedly accompany mid top sneakers utilizing premium materials and sneaker technologies. So as designer items and special edition models. Similarly, limited edition mid top sneakers or those produced in limited quantities are more expensive than the general releases or sneakers that are mass-produced. As with the other types of sneakers, mid top sneakers are available in a vast array of styles and variations. Also, most of the time, mid top sneakers are offered in a variety of colorways. As such, consumers would surely find a particular pair of these kicks that suit their style. It is also important to note that style is subjective and a personal preference of the buyer or the wearer. Like all sneakers in a bigger picture, some mid top sneakers may be perceived as stylish by some but not to others. What are some of the popular mid top lifestyle shoes? Released in 1985, the Nike Dunk SB Mid is designed for skaters who prefer a bit of additional ankle support than what low tops offer. These mid top sneakers feature an ankle strap for support, a traditional lace-up closure, perforated toe box, and a signature Swoosh visible on the sides. The Nike Air Force 1 is undoubtedly one of the most popular and iconic basketball shoes of all time. Debuted in 1982, it was the first basketball shoe to feature an air-filled pocket in the heel for support and cushioning – a technology known as the Nike Air. Although initially available in low cut and high cut variations, the mid top version of the AF1 was also introduced later on. The Nike Air Force 1 Mid features a perforated toe box, lace-up closure with ankle strap for support, leather upper, and Air sole unit for cushioning. The Nike Blazer first released as a basketball shoe in 1973, but now considered as a lifestyle or casual shoe. Named after the American basketball team Portland Trail Blazers, it was a famed on-court shoe of iconic basketball player George “The Iceman” Gervin. This iconic classic Swoosh received a mid-top variation under the Nike SB sub-brand called officially as the Nike SB Blazer Mid. It features a bold and thick sole with a smooth and clean finish. The Nike Air More Uptempo is the kind of sneakers that one would easily recognize even from afar because of its striking and bulky profile and eye-catching “Air” details on the side. Designed by Wilson Smith, this mid top sneaker first released in 1996 and retroed several times in the year 2005, 2006, 2010, and 2015. It started gaining popularity when basketball legend Scottie Pippen wore it during the '96 Chicago Bulls championship run and, again, in the '96 Olympics. In 2017, a Nike and Supreme collaboration on this iconic silhouette was released. The Adidas Pro Model is the mid-cut iteration of the Adidas Superstar. It also features an all-leather upper and the iconic rubber shell toe. Another notable mid top sneaker from the Three Stripes is the Adidas Hoops VS Mid. Classified under the Adidas Neo sub-brand, this model took inspiration from a basketball shoe silhouette. One model from Asics’ line up of mid top sneakers is the Asics Gel Lyte MT. Aside from its recognizable profile and mostly subdued colorways, the Gel Lyte MT embraces an interesting story of how its design came to life. The Gel Lyte MT’s design is a fusion of three iconic Asics Gel shoe models. It got its sockliner from the Gel Lyte V, its padded split-tongue from the Gel Lyte III, and its heel clip from the Gel Respector. The Puma Fierce Core is a women-exclusive mid top sneaker with a neoprene slip-on construction, laceless closure, and mesh overlays. Pull tabs are present on the heel and tongue for easy wearing. Initially dropped in 2016, it was Kylie Jenner’s first shoe with Puma. One of the most iconic skateboarding shoes ever released is in the form of the Vans Half Cab. It is known best as American professional skateboarder Steve “Cab” Caballero’s legendary signature mid-top skate shoe. Originally released in 1992, it was the “lighter, better, and faster” version of the Vans Caballero Pro model. It features a sturdy suede upper, lace-up closure, reinforced toe cap, padded collar and tongue, and Vans signature waffle-patterned rubber outsole. The Vans Half Cab Pro is the upgraded version of the classic Half Cab with additional features such as single-wrap foxing tape, UltraCush HD sockliner for greater board feel and impact cushioning, and the DURACAP reinforcement rubber underlays in high wear areas. What size should I get if I am a woman who wants a pair of men-exclusive or unisex mid top sneakers? For men-exclusive and unisex shoe models, the ladies are advised to get a pair in an approximate of 1.5 to 2 sizes down their usual size. For example, if you are a size 10 in women’s sizing, you should opt for a size 8 to 8.5 in men’s sizing. Are mid top shoes also offered in narrow and wide sizes? How do you wear mid top sneakers with jeans? Mid top sneakers are your best choice if you opt to tone down a smart look without looking too casual. Slim-Fitting jeans look great with mid tops, and the "pin rolling" styling technique can be used to show off your kicks fashionably. Pair it with a plain shirt and throw over a jacket, if the weather permits, for a relaxed and casual vibe. What are some points to note when wearing mid top casual shoes? Mid top sneakers are primarily used for casual outfits. Make sure that your jeans or trousers are neither too long nor too short; the length should just fall above the sneakers. Also, note that the colorway of your mid top sneakers would suit the color scheme of the rest of your outfit. How much do mid top lifestyle kicks for men and women cost? Pricing of men’s and women’s mid top sneakers is no different to that of low tops and high tops. Prices range from budget-friendly (below $100) to highly expensive (as high as $250 or even higher) for both men’s and women’s mid top sneakers. Several factors are considered such as the materials and technologies used, the type of release, and others. Generally, mid top sneakers are a little bit expensive than low tops because they require additional materials. Say for example the Adidas Campus Vulc II retails at $70, but its mid top counterpart, the Adidas Campus Vulc Mid, retails at $75. Further, mid top sneakers utilizing premium materials and top-of-the-line technologies are expectedly pricier than the regular models. But these mid top sneakers are also assumed to be of better quality. Are mid top sneakers also available for kids? Yes. Different sneaker brands like Nike, Adidas, Vans, New Balance, DC Shoes, and Converse offer kid-size versions of their popular mid top sneakers. What are the popular fashion trends in mid top sneakers? Due to their overall profile and shape, mid top sneakers have limited designs and styles opposed to the versatile low tops. But this does not stop mid top sneakers from being a fashion staple and part of the latest fashion trends. Below are some of the trends in sneakers that also apply to mid tops. Metallic mid top sneakers. Metallics are more common in women’s mid top sneakers than in their male counterparts. The metallic finish (often in gold, silver, or bronze) on the upper adds an instant statement to any outfit. Platform mid top sneakers. The platform trend is everywhere in low top sneakers, but there are also mid top sneakers that follow this stylish and functional trend like the Puma Platform Mid Velour. The platform sole adds a bit of height to the wearer, making it ideal for the petite ones. Zipper mid top sneakers. The zipper type closure for mid top sneakers is common, and it serves its function not only for easy on and off wearing of the shoe, but also as an added aesthetic value. Some of the mid top sneakers following this trend are the Puma Basket Winter Mid and the Nike SF Air Force 1 Mid. Sock-like slip-on mid top sneakers. There is a fair share of mid top sneakers that feature a one-piece upper with sock-like and slip-on construction. Many prefer this fashion trend in mid tops because of the convenience along with the stylish look and comfortable feel that this kind of shoes delivers. Some of the mid top sneakers that feature this trend are the Adidas NMD_CS2 Primeknit, Adidas by Stella McCartney Ultraboost X Mid, Puma Fierce Core, Puma Fierce Quilted, Adidas Tubular Defiant Primeknit, and the Adidas Stan Smith Sock Primeknit. What is the proper way to clean mid top fashion shoes? Always consider the material used in your pair. Knowing how to clean your shoes properly will help keep them last longer. Mid top sneakers made of suede upper material should not get wet to maintain their quality, aesthetics, and durability. To clean suede, you may use a suede brush or a suede cleaning kit that can be bought at most shoe stores or online. Canvas mid top sneakers can be washed, but bleach should not be used to avoid discoloration and damage. Spot cleaning can also be done by brushing it with soap and water mixture. For leather mid top sneakers, a cleaning solution specifically made for leather material should be used to avoid damage. Shoe stores typically sell leather cleaning solutions. As for knitted mid top sneakers, premium brush with soft bristles should be used. You must brush dirt and dust off your mid top sneakers before cleaning them with cleaner solution or warm water and soap mixture. The shoe laces should also be cleaned, especially if they are white. They can be machine wash (except leather or suede laces) but must be placed first in a lingerie bag or pillow case, or handwash using water, baking soda, and dishwashing liquid. For suede laces, a suede cleaner should be used. Similarly, the insoles should also be cleaned to reduce shoe odor and keep the shoe fresh. They can be aired out or stored in an enclosed box with baking soda. To clean rubber soles, brushing with baking soda and rubbing alcohol can be done. Also, another product highly recommended by many is the Mr. Clean Magic Eraser. After cleaning, regardless of the material and cleaning method, the shoes must be air dried at room temperature.